Provide comfort for the family of Baby Jacob Powell with a meaningful gesture of sympathy. Baby Jacob Nash Powell entered eternal rest on Monday, March 4, 2019, Dry Prong, Louisiana. Funeral services for Baby Nash will be held at 10:00 a.m. on Saturday, March 9, 2019 at New Prospect Baptist Church in Dry Prong, with Reverend Kirk Maxey officiating. Visitation will be on Friday at the church from 5:00 p.m. until 9:00 p.m. Burial will be at Oak Grove Cemetery in Bentley, Louisiana, under the direction of Gallagher Funeral Home and Crematory, Ball, Louisiana. Baby Nash was preceded in death by his maternal grandmother, Tonia Lasyone. Baby Nash is survived by his loving parents, Jacob and Lacy Powell of Colfax; paternal grandparents, Robert and Debra Powell of Colfax; brother and sister, Waylon Powell and Hadley Morgan; and a host of friends. Pallbearers honored to serve are Caleb Powell, Jake Lasyone, Tanner Pittmon, Nathan Alwell; and Jaydon Leggett, and Cainyn Leggett. Friends may post online messages of condolence for the Powell family by visiting www.gallagherfh.com. We encourage you to share your most beloved memories of Baby Jacob here, so that the family and other loved ones can always see it. You can upload cherished photographs, or share your favorite stories, and can even comment on those shared by others. 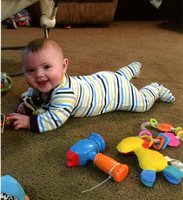 Provide comfort for the family of Baby Jacob "Nash" Powell by sending flowers. Dear Powell Family, We are so sorry for the loss of your precious baby, Nash. Please know that such horrible tragedies are not the plan or will of our Loving Heavenly Father and He promises that soon all human suffering will end, including the sting of death. He has promised to remove death forever and He will use his son, Christ Jesus to raise our loved ones as promised at John 5:28&29 and Revelation 21:3&4. We pray His faithful promise bring you a measure of peace and comfort.